With the sudden and dramatic red-ringing of my Xbox 360, and the couple weeks wait for a refurbished return, I took the opportunity to spend some time on the neglected portion of my play list, the PC games category. First up, the Black Isle AD&D classic with one of the worst cover designs in history, Planescape: Torment. Actually finding the game was more difficult than it should have been. With services like Steam and GOG out there, why hasn’t this title been packaged in a tidy downloadable format? It may have something to do with the AD&D license or ownership, but Planescape: Torment is playable on GameTap (unfortunately in an unmoddable form), so someone has crossed that hurdle. Anyway, I came across a battered disc in the neglected software box in the garage, scrounged up disc two online, and was good to go. 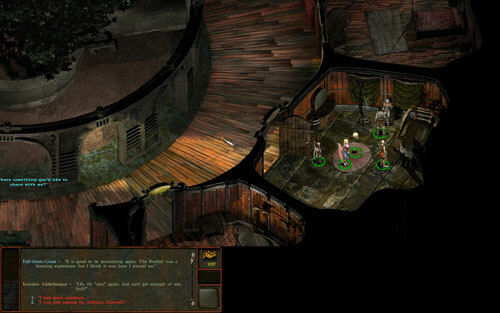 The fan community surrounding Planescape: Torment is active, and in the decade since the game’s release, several patches and mods have been independently developed. Beyond the whole fixing bugs and typos thing, there’s a patch that completes and implements unfinished content, and another that enables higher resolutions and widescreen play. The overall improvement after installing the lot of ’em is striking, and really makes for a better gaming experience. Now, even post-patching, Planescape still has elements that feel barren and unfinished, particularly those dealing with AD&D particulars. Aside from tattoos (which are treated like any other removable piece of gear, but usable by only a handful of characters) and jewelry, there is a distinct lack of wearable items, and by the game’s end, after days of play time, I still had characters in the party with empty equipment slots. The class differences felt shallow, possibly as a result of poor itemization, and the Thief class as a playable option probably should’ve been cut entirely. 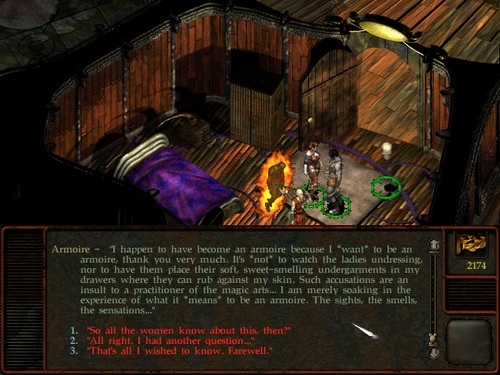 More so than most other games, even within the genre, Planescape is a reader. 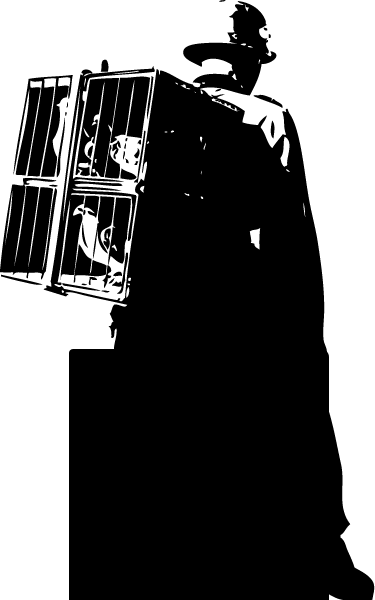 Alongside the voluminous story-forwarding dialog and text elements, there’s a full journal of content that updates as the game progresses, and a myriad of dialog trees to be followed with each of your (up to five concurrent) party members. Unlike most other games, however, the writing is all solid stuff, and I was genuinely interested in the story progression, background, and relationships as I played. The basic story treads a path that many others have worn beyond comfortable levels — powerful amnesiac who doesn’t know who or where he is (okay sure, it allows the player to learn as the character does), a wisecracking sidekick, and a mysterious big bad pulling the strings and generally making life difficult. The brilliant part of Planescape: Torment is how this was handled. Beyond the cliches, characters were well-developed, with unique qualities and individual motives and passions. The amnesiac story played out artfully with a satisfying culmination, and the fragments of memories and experiences peppered throughout the game gave it much of its color. And yes, as someone unfamiliar with the lore of AD&D’s Planescape, being given the opportunity to learn as the protagonist did was indeed helpful. In fact, it’s the story that hoists Planescape: Torment above its CRPG siblings, causing one (at least after installing the community patches) to excuse any bugs or issues as minor quibbles. It really is a fun game to play, one of the best western rpgs to date, and well worth the effort to track down and get ahold of. Give it a run through if you haven’t, and let me know what you think. + Expansive dialog, deep characters, excellent story. + Good ol’ Infinity Engine gameplay. + Solid soundtrack by Mark Morgan. + The Planescape setting was a refreshing take on traditional AD&D fantasy stomping grounds. + Awesome patching support from the community. Thanks, guys! – Poor itemization, especially wearable equipment. – Buggy in stock form. – Still not a fan of the box art.